Shooting hearing protection products are vital to hearing health if you choose to fire a gun, whether at the range or while hunting. We have you covered with passive hearing protection products including headband ear muffs, ear muffs for hat wearers, regular disposable and reusable ear plugs, as well as modern specialty hunting ear plugs that give you a choice of full protection or modified protection that lets you still hear most of what is going on around you while still providing noise protection. We also carry one of the largest selections of electronic hearing protection products, including both shooting ear muffs and hunting hearing aids. 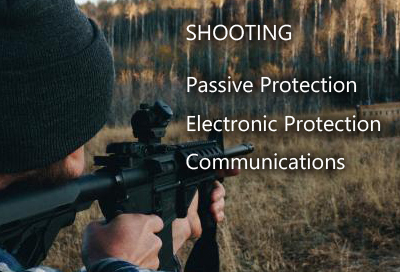 When you need to be able to communicate while remaining protected at the range or in a hunting group, we offer a number of two way radio comm systems that cover the gamut from under $100 to over $1000. Hearing protection for shooters today goes far beyond the old school solutions of ear muffs and foam ear plugs. In this department you will find a terrific array of choices that include the old standbys of passive ear muffs and disposable foam ear plugs, as well as modern convertible, non-linear acoustic filtered shooting ear plugs that let you hear low sounds but remain protected with higher noise reduction when needed. Electronic shooting products include electronic shooting earmuffs, electronic shooting ear plugs, and other products that give you protection from the sound of gunfire, while also amplifying surrounding low sounds to give you bionic hearing plus protection from noise. Two-Way radios either with or without high noise headsets are a critical element in successful group hunting expeditions as well as many other applications. We carry Motorola FRS/GMRS and BlueTooth two way radios, headsets with built-in two-way radios, other headsets, and more.